I really can't believe I finished this in time. Thread fiascos, discontined fabric and ridiculous shipping times almost put this off until next year. The threads I originally ordered took 2 1/2 months to get to me and when they finally did, the dye lots were such that they didn't match up as well as I had hoped. By that time it was already the end of September and I couldn't re-order something else, so I went stash diving and used threads I had on hand, picking colours on the fly. 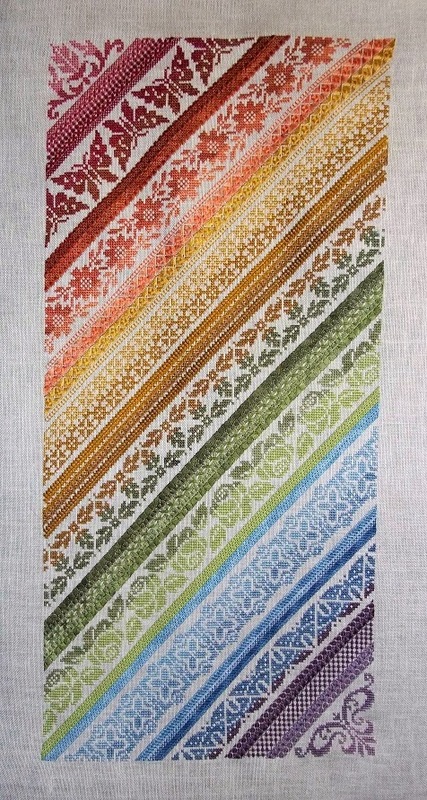 On top of that, the fabric I used for the model, Legacy Linen Oaten Scone has been discontinued. When did I find that out? AFTER I started stitching it. I didn't have time to order something else so I used it anyway, but I did find a near perfect match for it, thankfully. Then earlier this week, with the end in sight, I came down with a bug, which has knocked me on my behind. By yesterday I still had the darkest blue and all the purples to finish stitching and I was ready to give up, but I guzzled copious amounts of coffee and pulled an all-nighter and got the stitching, the charting and instructions finished. As far as my health goes, it probably wasn't a good idea, I feel like garbage again, but it was worth it. If I hadn't managed it I'd have been really bummed. So without further ado, here is Twisted Band Sampler. 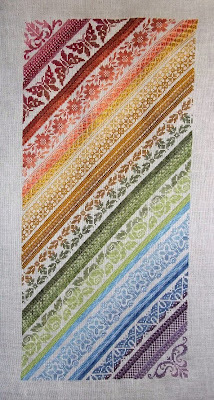 :) It's official release is Thursday, October 17, for the Online Needlework Show. It will be listed on the European Cross Stitch page. That's cool. Pleased you got it finished on time. I have never wanted to buy anything from the Online Needlework Show, but now I've seen this. I'll for sure be ordering this one. LOVE IT! That is a fabulous design! I really like the "twist" on a traditional band sampler. Beautiful design! Definitely going on my wish list!